Fix config.ini path resolution to the actual path where the script reside, not the working dir. Update page parser and unittest. 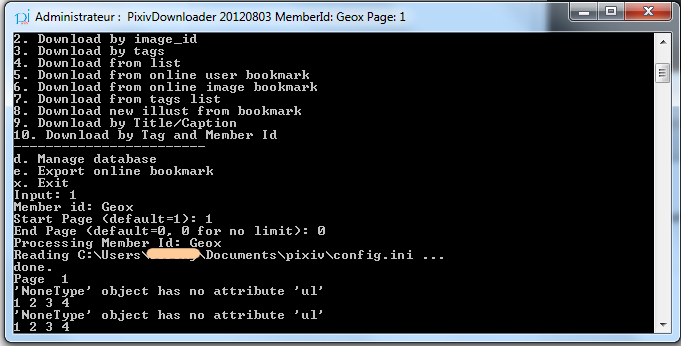 Append 0 for %page_number% depending on total manga page. start -> run -> cmd. Go to the app folder and run it, it should show the error, or check what is in the log file. Mine also set in Japanese locale, but all ok.
Also before that, save your config.ini using utf-8 encoding using notepad. set the save the folder without special character, rather extract the whole archive in folder without special character. Somehow got problem if the app folder have it. Sometimes, downloader writes into downloaded list multiple instances of one picture from manga. I do not know why. what is your filename manga format? Still gives errors for me. Did you see my post and try 29095819? 2012-08-03 18:56:15,142 – PixivUtil20120803 – INFO – Cookie already expired/invalid. 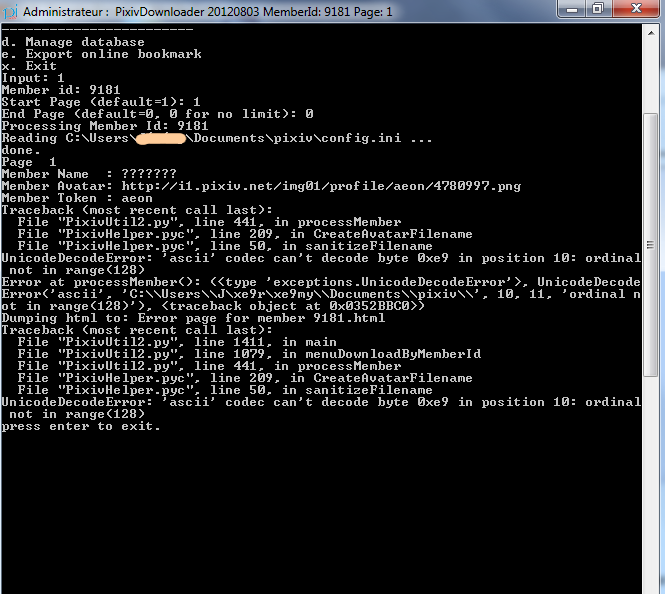 2012-08-03 18:56:15,142 – PixivUtil20120803 – INFO – Log in using form. 2012-08-03 18:56:36,003 – PixivUtil20120803 – INFO – Member id mode. Start downloading… 598694 of 598694 Bytes Complete. Start downloading… 577112 of 577112 Bytes Complete. Tags : C82, ???? ?????? ????????????????? ???????? ?? ??? ??????? ?? ?? Start downloading… 519509 of 519509 Bytes Complete. Tags : ????? ???? ??????????? ??????????? ????? ???? ??? ????? ??????????? an error while I am downloading new illust from bookmark when meet manga mode. 2012-08-03 22:54:44,099 – PixivUtil20120803 – INFO – New Illust from Bookmark mode.